Here I use the term “media” in a broad sense. It is any computer-generated environment: a program, operating system, or online setting of any kind. Therefore, a media transition is the changeover from one such environment to another. Sometimes the change might be small, as in updating from one version of a program to a slightly newer one. Sometimes the shift is large, as in installing an entirely new operating system or venturing into some area of cyberspace where you have never been before. In this article I would like to explore the psychology of media transitions. What thoughts, emotions, and behaviors come to play as one moves from an old and familiar environment to a new one? What determines success or failure in making the change? What motivates a person to try something different in the first place? A piano teacher I know once summarized what it was like taking piano lessons as a child: "It was like I was living in the land of mistakes." I'd like to offer a variation on that expression - one that applies to computering. It is like living in the land of errors. After all, do you ever go one day without something - big or small - going wrong with your computer? Sometimes the error is a failure to communicate between you and the machine. Something goes wrong because you haven’t figured out how the program works. Perhaps the program is not making itself clear about how it works. Or you’re just not paying attention. In other cases, the responsibility for the problem rests definitively on the shoulders of the machine. The program code or design is inadequate. Things don’t work right or the program totally crashes - and it isn’t your fault, unless we accept the expectation that we all should be computer experts who can prevent any problem before it occurs. But even the experts will tell you this is impossible. Computers are just too complex and intrinsically fallible. In this list, we see some of the psychological factors that motivate us to avoid or make a media transition. On the one hand, you may choose the path of work-around solutions, which sometimes gives “character” to the machine as your quirky but familiar companion. You’re the only one who knows its unique pattern of flaws and how to navigate around them. On the other hand, living in the land of errors can become too frustrating. It may even threaten your ability to communicate with others and the safety of your files. A change is necessary, sometimes a big change. Necessity: It's the mother of invention as well as media transitions. Our familiar programs, workspaces, and social environments seem a bit tired and outdated. They don't work as well as they used to, or we become painfully aware of how we could be doing a lot more than what the status quo allows us. In this age of information and enhanced communication, if others are gathering resources and sharing in ways that we can't, we may find ourselves woefully behind the curve and out of the loop. I was forced to upgrade to OSX when Eudora for OS 9 could no longer send emails. Sometimes you just have to move on. Pride: Being behind the curve is not exactly a prestigious position, especially for those who consider themselves sophisticated users or even hackers. Maintaining one's self-esteem requires that push into the next new thing that everyone is talking about, or perhaps even beyond them and into the leading edge of the curve. I'm not a professional digital photographer or website designer, but Photoshops CS2 and Studio MX make me feel like one. Competition: Not far from pride is the need to be at least one step ahead of the others. Bigger, faster, more powerful, unique. The shine of those winning medals can be irresistable, especially in a culture that idealizes both technology and competition. Mastery: Even setting aside the pride that might accompany one's accomplishments, people sometimes push forward into a new cyberspace challenge simply because it's a challenge. The competitive perks may be irrelevant. It's the sense of mastering the thing that motivates you. Perfectionism: Some of us might expect or hope that our machines will be flawless, that because we have control over it we can create a place where everything is just right. But as we all know, nothing is perfect. 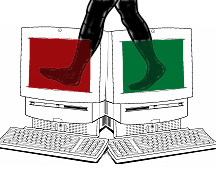 Perhaps our computer companions are doing us a favor by reminding us that we always will be living in a land of errors, no matter how many media transitions we make. The alternative is a kind of compulsive perfectionism in which a person never feels satisfied. In a restless pursuit of the utopian workstation, the person continually upgrades to new programs because in their minds “new” means “better.” The grass always seems greener in that other software. Adventure: Some people shy away from the unknown, while others seek it out. There are sensation-seekers who repel down cliffs and jump from airplanes, and they have their counterparts in the early adopters of cyberspace - the people who want to go where no one has gone before. It's an online rush or a pioneering spirit. That was my impression of many people at the Palace, back in its early days. The Carrot: At the end of the struggle, there's a specific reward. Your own blog. A burned disk of your favorite mp3s. Talking with people who love pugs, like you. Psychologists call it a "reinforcement." People will work long and hard for a big reinforcement, though usually there are small ones along the way, including those step-by-step moments of mastery. Magic and delight: You can spot computer geeks by their wide-eyed wonder when they see something they haven’t seen before. Humans have a primeval fascination for anything that looks like magic. When we see computers doing something marvelously new, or that we hadn’t believed possible, we can’t help but feel delight. We want to participate in and understand that magic. We want to go there. This list of motivations might be organized according to Maslow's famous hierarchy. At the bottom, we have those basic needs to resolve the practical problems of everyday living, which means we have to communicate in order to acquire resources. At intermediate levels, we establish social bonds, share experiences, and feel like we belong. At the highest levels, as we pass through stages of mastery and self-esteem, we enter new cyberspace environments as a way to self-actualize, to creatively express ourselves... and figure out who we are. Given all these factors that contribute to media transition motivation, we would expect that people are continually and without hesitation moving from one computer program and cyberspace environment to another. This, however, is not the case. Another force counterbalances that motivation to change, a force that slows down or even halts any transitions. Burn out: When making a media transition, we must devote time and energy to adapting to the new environment. If the learning curve is optimum, we experience the change as interesting and exciting. Beyond a certain point the experience becomes stressful. Although many people in western culture pride themselves on their busy lifestyle and multitasking abilities, technology changes so fast that it is impossible to keep up with every new invention – impossible even to keep up with the things you want to keep up with. There are a limited number of changes one can make. Trying to tackle too many media transitions creates cognitive overload and burnout. It’s like trying to catch several rabbits at the same time. Sensing this impending multitasking overload, people avoid making a change. Just the thought of adding yet another computer task can stimulate media transition anxiety. Fear of incompetence and failure: Media transitions are challenges at which we may not succeed. No one likes to feel like a failure. No one likes to feel foolish or stupid. When moving to new media, we become a rather incompetent novice again, a newbie, which is hard for some people, especially if it is a social environment and the person is concerned about his/her image and reputation. People may wish to remain in an old environment that they have mastered rather than transition to a new one where they lose those feelings of prestige and mastery. Some computer-savvy people, who take pride in their skills, might find the newbie role especially difficult to handle emotionally. Fear of the unknown: A big transition requires entering an environment that is totally new and unfamiliar to the person. Humans often respond with anxiety to the unknown. You don’t know where you are. You don’t know what to do. You can’t figure things out. The resulting anxiety might be especially intense in new online social environments where you will interact with others.In addition to the anxiety of figuring out how the software works, one must also figure out how the social system works and how to behave appropriately within it. Culture shock is not uncommon. In your old and familiar social milieu, you are used to a certain type and level of self-presentation. Moving to a new environment requires reestablishing your social identity and renegotiating how you wish to express yourself. What do you want to reveal or not reveal? Those decisions and that process can be anxiety-inducing, especially when others don’t react to you the way you wish or the way to which you are accustomed. Fear of rejection: One response from others in a new social environment could be rejection. Or they ignore you, which is a particularly insidious type of rejection. Sensing this possibility – especially for people who are sensitive to rejection – a person may avoid moving into new social realms. Ignorance: That’s a strong term, but in some cases simple ignorance does prevent us from trying something new. We just don't understand what we're missing out on. We don't get it. That may be a lack of imagination and curiosity on our part, or we just don't want to understand, in which case we're probably suffering from unconscious MTA and one or more of the issues listed above. No matter how simple or useful the new program might be, we avoid it simply because we don’t understand, don’t think we’ll understand it, or don’t want to understand it. Some people harbor irrational anxiety about the computer simply because it’s a “computer” – that complex machine which only smart people use. They are happy with what they can do on their machine and avoid doing or even trying to comprehend anything else. Fear of problems: Unfortunately, media transitions do not always proceed smoothly. If you upgrade in order to solve a problem in your previous environment, sometimes that problem is solved, sometimes not, and sometimes new, even bigger problems surface. Trying to make things a little better can make what you already had a lot worse. The philosophy “If it ain’t broke don’t fix it” has some validity. If you’re working on a deadline, you may not want to take the risk of sabotaging your progress by trying out a new program. There also is the fear – sometimes irrational, but not always – that if you try new software, a catastrophe might ensue. Your computer will crash and burn. You could lose files. You could lose everything. Our trepidations about the machine going awry boils down to two fundamental anxieties. First, there is separation anxiety: the anxiety about being disconnected from online relationships and one's online lifestyle. Then there is anxiety about loss: on a concrete level, the loss of important, even pecious files; and on a more psychological level, the loss of one's identity that is associated with those files as well as the potential loss of self-esteem and self-confidence. Actually, these two anxieties might boil down to just one, because anxiety about separation is anxiety about losing the connection to others. So there you have it. It's all about loss. Cultivate a healthy Buddhist attitude about how all things must pass, and you'll never get anxious about your computer again. I can imagine a modern Zen master instructing us on how every program and every file on your machine is a little piece of your identity that you don't have to cling to. Just let go. Traditionally, in psychology, "mental set" refers to a fixed pattern of thinking that fails to take into consideration new information or perspectives. For example, the early astronomers tried to calculate the movement of planets based on their assumption that all heavenly bodies revolved around the earth. They were caught in a mental set that led to strange conclusions about the shape of planetary orbits because they failed to see a different perspective: all the planets revolve around the sun. So, extending that concept, I'm proposing the idea of Media Mental Set - i.e., how people's thinking and perspective can get stuck within a certain computer-generated environment. They approach issues and problems, including psychological and social ones, strictly in terms of that particular environment, while failing to see alternative solutions and experiences offered by other types of environments. Their thinking gets mentally stuck within that media. For example, some people figure out how to use Hotmail, but won't try another webmail service with a similar but significantly better interface simply because it's not Hotmail. Sometimes the “ignorance” factor I mentioned earlier contributes to MMS. It's not that people are unable to understand a new technology. Instead, they may be suffering from the mental set that it’s too different or difficult for them to understand, even if they are already doing something at least as complex in another program or environment. When they face that new media, their minds go blank. MMS is determined by personality and attitudinal factors, and not simply limitations in intellectual and critical thinking abilities. It's interesting how even some intelligent people who are quite knowledgeable about online lifestyles can still get locked into a mental set about the type of media they prefer. They tend to idealize it. Their self-esteem and identity is invested in it. They harbor nostalgic feelings and memories about being there. They may feel the need to protect those feelings, memories, and identity, which can lead to an intellectual defense of their media that looks like territorial behavior. They might also be experiencing some media transition anxiety. Media mental set can become a norm for a whole group of people. The group may shape it's identity around that media and their collective media mental set. A few times, when offering some consultation for professional groups operating via an email list, I've recommended that the group experiment with a discussion board format. Even when the group considers itself sophisticated about online communication and specifically wants to develop itself as an online organization, the resistance among some people to trying a new modality can be surprisingly intense. Every time I mention a benefit of discussion boards over email lists, there is a flurry of retorts about how "you can do that in email too." Or the points about the benefits are ignored, as if they flew right past people's heads. If I could see their faces, I imagine their eyes momentarily glaze over before their thinking snaps back into the same old same arguments about why they prefer email lists. Sometimes we convince ourselves that we are happy where we are. We believe we don’t really need to try anything new. It’s not worth the time and effort. We think our computer lifestyle is going fine right now, so why change. If it ain't broke, don't fix it. Blogs are things other people do. I'm not a blog-type person (feel free to substitute in any other word for "blog"... like RSS, podcasts, social networks). Psychologists would point to such thinking as examples of rationalizations, or as attempts to manage cognitive dissonance. Many people might find it contradictory and illogical to say, “This new thing is wonderful and I’m not doing it.” Instead, in order to maintain what appears to be a reasonable concordance in their beliefs, they find fault with the new thing they are unable to do, for whatever reason. However, it’s important to avoid pathologizing Media Mental Set. As Piaget clearly demonstrated, there is a natural human tendency to see things in terms of what we already know - according to the familiar cognitive templates that make our lives predictable and manageable - and to overlook or minimize things that are novel. Ideally, we learn how to balance our familiar and useful mental maps with the ability to challenge and modify them according to alternative ways of thinking. Everyone goes through an adaptation period when entering new media. That adaptation period will be longer and more challenging when making a transition to a very different environment. New social environments may pose special challenges. Here are some suggestions to keep In mind. Investigate: Keep an open mind about new media. Read and talk about it with experienced users before trying it out yourself. If a friend or coworker lets you, try out the media on their machine first. Minimize cost, maximize benefit: Small changes are less risky than big changes, especially in times of crisis. If there’s no particular crisis at hand, a big transition might be worth a try. Expect a learning curve: Even when making small changes, there will be new things to learn. Read the FAQs and manual. Talk to people. You may need to develop new perceptual and motor skills in order to use the media effectively. If it’s a new social environment, you may even need to develop different interpersonal skills. Usually in a new social environment, you will need to learn the software first before you can tune in to the people there and understand the culture of the group. Accept confusion: In the period of adapting to the new media, it’s quite normal to feel confused and frustrated. Don’t assume you will be able to figure everything out quickly. Investigate menus. Click on some buttons. Take baby-steps. Something may confuse you today, but you very well may figure it out tomorrow. If you understand quickly everything about the new environment, then it’s probably not a very comprehensive environment. Also accept the fact that no program is perfect. Even excellent media have some design flaws. Sometimes your confusion and frustration is justified. Observe, then participate: In a new social environment, observe how people behave. Try to understand the norms of the group – what is considered acceptable and unacceptable behavior – before you start to participate. Embrace the newbie role: It’s OK to be a newbie. Ask for help. Don’t pretend to possess knowledge that you don’t have. Listen to people who are familiar with the environment. If it’s a social setting where old-timers aren’t interested in helping a newbie – or especially if they are unwelcoming to newbies - then it might not be a place where you want to stay. Decide if it’s for you, or not: Cyberspace is filled with all sorts of media. Some are perfect for you, some aren’t. Everyone has his or her own unique set of cognitive, perceptual, and social skills. Everyone has unique interests. Decide when it’s a good idea to stretch your skills and interests into new territory, and when a certain environment simply does not match your skills or interests. Dealing with emotional people: People who call tech support often are frustrated, confused, overwhelmed, and sometimes desperate and angry. They might even show transference reactions to the tech support person - emotional reactions that come from other relationships in their lives and really have nothing to do with the tech support person. Some tech supporters are patient in the face of these emotions. Others lose their composure, and respond with impatience and poorly suppressed anger. They might be struggling with their own transference reactions. Assessing the client's knowledge: If you're going to help a person with a problem, it's a good idea to get a sense of how much the person knows about it. Some tech support people catch on quickly to the fact that the client is computer savvy. They are willing to work together in solving the problem. Others seem oblivious to the client's knowledge. They continue talking in a rather pedantic way, even when the client tries to prove that he/she is not a total newbie. The tech talk ratio: Once the client's knowledge level is assessed, the tech supporter should, ideally, talk at a level of technical sophistication that matches the knowledge level of the client, or maybe slightly surpasses it, which gives the client an opportunity to learn something new. So a 1:1 or slightly higher ratio of expert-to-client technical discourse is good. A low ratio means talking to clients in overly simplistic terms, as if they are stupid or children, which no one likes. A high ratio means talking over the person's head, which may impress some people, but few people like that either. They may feel overwhelmed and inadequate, or that they should just give up in tackling a problem or a media transition that seems too complex. Talking over someone's head rarely is an effective strategy. Rote responding: I'm sure tech support people deal with many of the same issues over and over again, so there's a tendency to fall into rote patterns of solving a problem. Their instructions and speech patterns become robotic. Unfortunately, there's a danger that they might be thinking in a mental set and not actually hearing what the client is saying, Instead they hear and respond to what they expect the person to be saying. Sometimes doctors make the same mistake. Showing optimism and enthusiasm: People with problems like to know that there's a light at the end of the tunnel. A good tech supporter shows some optimism. It doesn't happen often, but once in a while the tech support person gets excited talking about computers, usually in response to a question they find interesting, or in reaction to a client who seems to understand something about computers. People who are frustrated and disappointed with their machines usually want to regain that enthusiasm that they might have lost. Speculation: One tech support person told me that "I'm not supposed to speculate." I guess they don't want to mislead people. And yet, they often seem to speculate about the cause of a problem. That could be a good thing, as long as the client doesn't get confused or makes bad decisions based on the speculation. Acknowledging one's limitations: We may want to idealize the tech support staff, hoping and praying that they have the solution to our problem. But let's face it: no one knows everything about computers. Perhaps in some cases the tech supporter needs to appear like the omniscience healer of the machine, but most of the time it's probably better to admit when they don't know something - that when they have to put you on hold it's because they're consulting their supervisor or some documentation. When I asked one worker at Apple exactly what "file permissions" were, he replied honestly, "You're asking something that goes over my head"... and then he proceeded to describe to me what he did know about the topic, which went over my head. I appreciated and respected him for that.